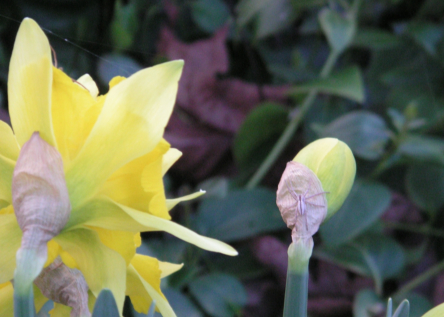 The white daffodil spider, waiting for food. 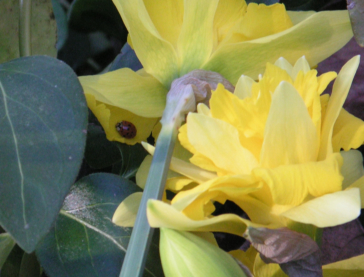 On the menu are house flys, knats, aphids, lady bugs, and any thing else that crawls around on a daffodil. Notice the thred on the flower, a trap waiting. 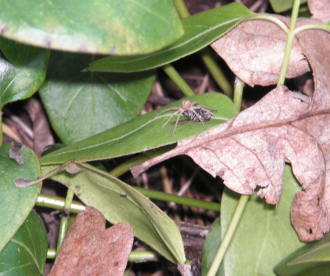 It almost looks like there is a spider hiding underneith the spider thred, its legs just poking out from behind. 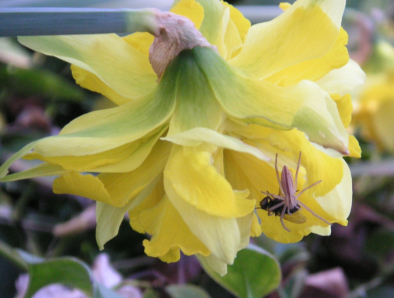 They will do that, spiders can be found anywhere on a bloom, though just one spider per flower. Home is where the food can be found. Two feet over, another spider was already feasting. I was wondering if a house fly would be too large for these little spiders, but I guess not. This is what happends when slugs are allowed to range free on the land, they eat the flowers. Not sure what biological niche the slug fills? 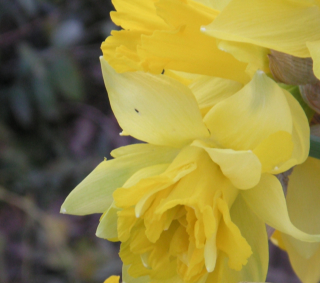 There are these little black flies - knats - that like to fly around the flowers. Found this ladybug while on my insect hunt. 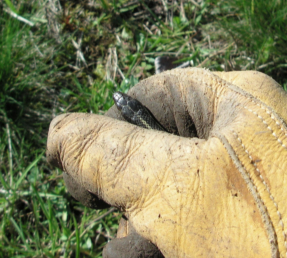 These harmless garden snakes are found hiding under the piles of branches. They are uncommon enough that it warrented a photo. One of the bunnies. They just mill about the yard, eating grass and enriching the soil. They can take care of themselves - which means that in 20 years there could be 1200 bunnies running around here. Found this bumble bee doing its thing. 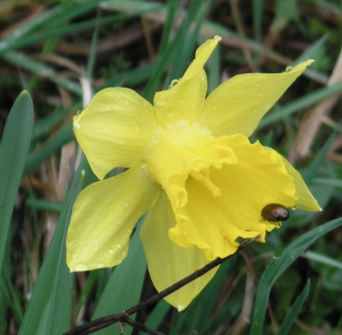 Picked the flower and walked it all the way from the far corner of the daffodils to the house with this bee inside. Spent some time taking pictures. Some kind of catapilar moving around on the bloom. 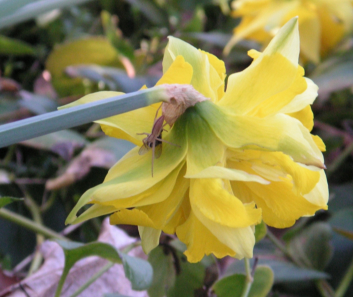 This is how you find most of the slugs, curled up inside a trumpet, eating the necter and pollen, sleeping. 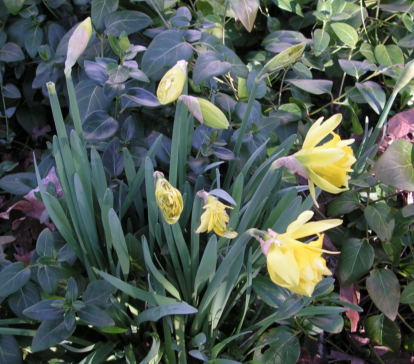 The trumpet is sort of a nursery for the slug; the blooms open up just in time for the newly hatched slugs to crawl into.